Claim £20 cashback from Canon. Offer runs from 3/11/2011 - 25/01/2012 (inclusive). For more information and to claim the cashback please click here. 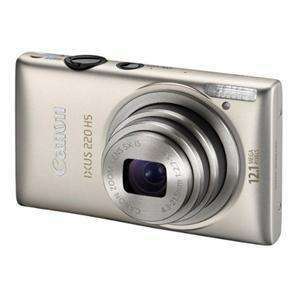 Adding the Canon HS (High Sensitivity) system to the Ixus range, the Canon Ixus 220HS also has an ultra wide 5x zoom lens and Full HD movie recording, all in the characteristic sleek stainless steel Ixus body. The 5x zoom lens on the Ixus 220 HS covers the extra wide 24mm (equivalent) focal length. This is fantastic for dramatic landscapes and indoor group photos. For when you need to zoom in, the lens is equipped with optical image stabilisation to counter any shake that may cause blurred images. The Ixus 220 HS uses a High Sensitivity 12.1 Megapixel Sensor. This back-illuminated CMOS sensor is more efficient than conventional sensors allowing more light to be recorded. This gives less image noise and the ability to shoot better photos in low light. Record movies in full 1080p HD quality with Optical Zoom, Dynamic IS and Stereo sound. Dynamic IS (image stabilisation) is enhanced image stabilisation and suited to the larger arm movements (wobble as well as shake) often encountered during movie recording. Also features HDMI connection with CEC for easy viewing on your HD TV and control using its remote. The LCD monitor on this Ixus has a tempered glass layer giving excellent contrast and a wide viewing angle, even in bright ambient light. The Smart Auto mode on most camera models has a collection of say 5 or 6 scenes which the camera chooses as most appropriate. The Ixus 220HS chooses from 32 modes, making sure that the camera settings are well matched to the scene you are shooting. The Ixus 220HS has a selection of creative modes which give particular special effects. These include a simulation of a fisheye lens, miniature effect and a toy camera effect. Hey guys, I put this up as I have been in the market for AGES I hope it goes hot as I think I may buy it, however can anyone recommend any other better cameras around this price or a little more and also does the SX220 (I dont need GPS) warrant the extra £££?? Bigger brother Powershot SX220 HS is better if you can stretch, if you can stretch more than the S95 is the one to get. All 3 are good cameras. "Payment is only taken when you collect your order in store, by credit card, cash or gift vouchers in store." the cashback is through canon so you will get the cashback. Excellent camera and a great price! Sorry Klawson I did a search the silly HUKD search is really terrible haha. 1) Delivery to store or home is still delivery and buying you will still get cashback surely? 2) It says the price is including cashback in the title does it not? 3) Wow that Amazon deal seems like a good price didnt see it posted though! Yes you will get cashback from Canon but not from Quidco since payment is on collection. Also available at John Lewis for £129.99 with the £20.00 cash back from canon. Also better customer service at JL so I just bought one!